Back when I was younger and first watched the Star Wars movies my favorites were Yoda and Han Solo. I recently watched the two latest Star Wars movies again and thought they were better than I remembered. Again, one of the best parts was definitely Yoda. I guess he was an early introduction to personal development and spirituality long before I had much interest in this stuff. So today I’d like to share three of my favourite words of wisdom from that green little awesome guy. You could do very well in any area of your life by just focusing on these few tips. Things don’t really have to be that complicated. Get these things handled reasonably well and your world opens up big time. When you tell yourself and/or someone else that you will try you are in my experience more likely to give up or just stop when the first obstacle shows up. When you say that you will do something there is more determination and power behind that decision. When the inevitable obstacles that always show up start to block your path you are determined. You will do this. So you find ways over, under, around and through the obstacles. And that’s what you have to do most of the time to actually get things done. Smooth sailing with no problems at all is pretty rare. By making clear choices to do or not do something – and putting power behind those choices – you are more likely to actually get things done and succeed. Overcoming your fears is one of the most important things to improve yourself and grow. If you don’t you will just get stuck. But how do you do it? Well, first, as Yoda says, you have to stop avoiding your fear. You have think about it and see what is you really fear. After you have brought some clarity to the situation, here are three of my favourite tips for actually overcoming that fear. Maybe not what you want to hear, but in my experience and from what I have learned from others this is the best way to overcome your fear. And if you have to handle a big fear, whatever it may be, and later realise you actually survived it, many things in life you may have feared previously seems to shrink. Those fears become smaller. They might even disappear. You may think to yourself that what you thought was a fear before wasn’t that much to be afraid of at all. Everything is relative. And every triumph, problem, fear and experience becomes bigger or smaller depending to what you compare it to. This frame of mind makes it easier to face what you fear. When you are stuck in fear you are closed up. You tend to create division in your world and mind. You create barriers between you and other things/people. When you shift to being curious your perceptions and the world just opens up. Curiosity is filled with anticipation and enthusiasm. It opens you up. And when you are open and enthusiastic then you have more fun things to think about than focusing on your fear. How do you become more curious? One way is to remember how life has become more fun in the past thanks to your curiosity and to remember all the cool things it helped you to discover and experience. The ego wants to divide your world. It wants to create barriers, separation and loves to play the comparison game. The game where people are different compare to you, the game where you are better than someone and worse than someone else. All of that creates fear. Doing the opposite removes fear. That there is no real separation between beings, that we are one and the same, might sound a bit corny. But one thought you may want to try for a day is that everyone you meet is your friend. Another one is to see what parts of yourself you can see in someone you meet. And what parts of yourself you can see in him/her. There is often an underlying frame of mind in interactions. Either it asks us how we are different to this person. Or how we are the same as this person. The first frame is based in how the ego likes to judge people and create separation to strengthen itself (either through feeling better or more like a victim). The second one creates warmth, an openness and curiosity within. In that one there is no place to focus on fear or judgement anymore. This is a bit similar to the previous tip. Use both and see what works best for you. 3. Your world is a reflection of you. That's what Luke is told in “The Empire Strikes Back” before he goes into the cave on Yoda’s home planet. Inside the cave Luke battles his demons – more specifically an illusion of Darth Vader – and are confronted with his owninner darkness. The darkness he brought into the cave and that could pull him over to the dark side if he allowed it to. I think this is relevant in our world too. You find in your world what you bring into your world. And in your world you can see yourself – your thoughts and behaviours – reflected. By observing the world around you can gain insights into yourself and what you may need to improve. Because even though there is big, big world out there with many possibilities and people in the end big change in your life comes down to you changing yourself. It’s very easy to get stuck in thinking that your perspective, the lens through which you view reality is reality itself. But you can’t really see reality. You can only see it filtered through the lens. And the lens is you. Changing, for example, a very negative attitude to a very positive one changes how you view yourself and your entire world. But it’s very hard to convince anyone of this. You just have to choose to try another perspective and use it for a month or so. Even though old thought patterns may want to draw you back to the comfortable stability of your old viewpoint. Which may cause you to rationalize that this positive attitude stuff is uncool or cheesy. Truth is life will never be as in your dreams if you don’t change and correct yourself. No one is coming to save you. No book or personal development guru, not your parents, no knight/lady in white armour. Yes, people around you can of course be a big help. But as an adult in this world it is time to grow up and save yourself. It is time to do things. To face your fears. Not just because those things are the right things to do. But also because these things are what actually work. I LOVE Yoda – have always thought he was one of the smartest people in movies ;). Thanks for the reminders – particularly about finding what we bring in. When we say we will try to do something, normally we don’t do it. Language does make us affect our thoughts and action, so we should always choose our words carefully. Don’t try. Do. It’s that word “try” that stagnates most of us. Keeping us from accomplishing our most desired goals. “Try” is like a security blanket that keeps us from facing our fears. I’m always justifying my failures with the statement “at least I tried.” I should be “doing” by allowing myself the chance to fail and continue to make attempts at accomplishing my goals. I keep it simple now. I “do” by setting small goals and accomplishing them as I move toward a greater purpose. Thanks for this. “Fear of loss is the path to the dark side” is another good one — you can’t enjoy what you’ve achieved if you’re constantly obsessed with the possibility of losing it, and it’s hard to concentrate on your projects if you’re obsessed with the risk of failure. Wonderful post. Yoda is a Buddhist, you know? I posted on FriendFeed and Twitter. Have a great day! Good stuff! Did you watch the broadcast of them on Spike TV? Terrific post. The quote about trying has stuck with me since I first saw the movie all those years ago. It comes to mind whenever I catch myself or someone else saying they’ll “try” to do something. Thanks for the reminder of other Yoda quotes, too, along with your added insight. Great quotes! I love Yoda and you pulled some great lessons together here. However, I must pull in my own perspective and feel led to write briefly here. I know that not everyone believes as I do, but many millions do — a Christian Worldview rather than an Eastern/Pantheistic Worldview. Now that you know my “filter,” your comments about “grow up and save yourself” at the end of your post lead me to write a note. Here’s my basic question: does that work for you? can you really “save” yourself? Truth is we are created beings and can only be saved by our Creator. God has created us to be self-aware but with a need for Him. Jesus Christ is the only way for us to saved, the only way for us to conquer our fears, the only way for us to be able to “do” anything meaningful in this world. He is also the only way to not just be happy to experience true joy that is not based on our situation or circumstances. Just thought I would add my voice to a discussion that seems void of this perspective. I just came across your blog and loved the analogy. It’s words to live by, and you summarized it nicely. There is a blog of a guy who worked on the creature crew for Empire Strikes Back. He said that his preferred theory of how Yoda got his name is from the Sanskrit word Yoddha which means “warrior” or from the Hebrew name “?? ?” (pronounced “Yodea”), which means “one who knows” or “he knows”. What is the source of your Yoda quote, “Named must your fear be before banish it you can.” I have seen these movies hundreds of times, i received a BA using SW in everything I ever wrote. Nowhere does that quote appear in a film. Was this an out take, a blooper, a book, a comic, a radio drama, a cartoon, a web strip…..Please, explain to me where this so-called Yoda quote comes from. 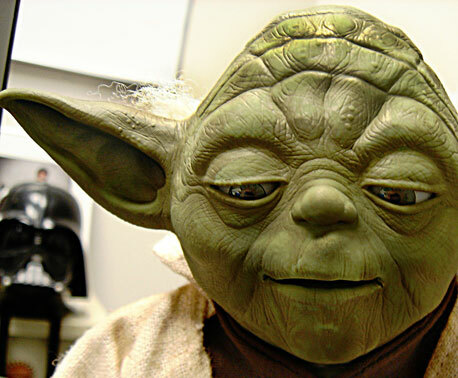 Please divulge your source for the Yoda quote about naming your fear. I have seen the movies hundreds of times, and have used them in countless papers when discussing the heroic journey and I have never come upon this quote. Please tell me what medium it is to be found: Film, Blooper, Book, Comic…etc.